Yes, like many who study digital rhetoric, I have seen the eye-popping TED talk by Blaise Aguera y Arcas about "collective memories," in which he shows a demo of Photosynth to the marveling crowd. Perhaps the most dramatic image from the presentation of what is now a Microsoft product was the moment in which he zoomed and panned around a 3-D rendering of the front façade of the cathedral of Notre Dame in Paris composed of photographs from tourists who had posted their images on Flickr. 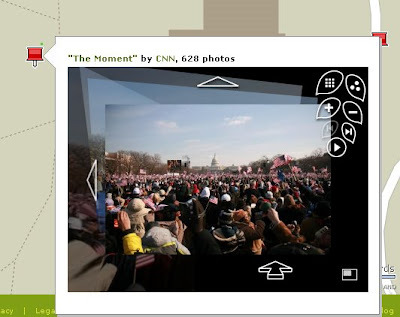 For "The Moment" CNN urged those who were in attendance at the Obama inauguration to upload their photographs of the event so that the software could do its magic. Unfortunately, many of the views have far too few photographs contributed to the database to make for a compelling virtual reality experience, although it is striking to get a sense of how many heads back one could be from the swearing in if you were on the Washington Mall.